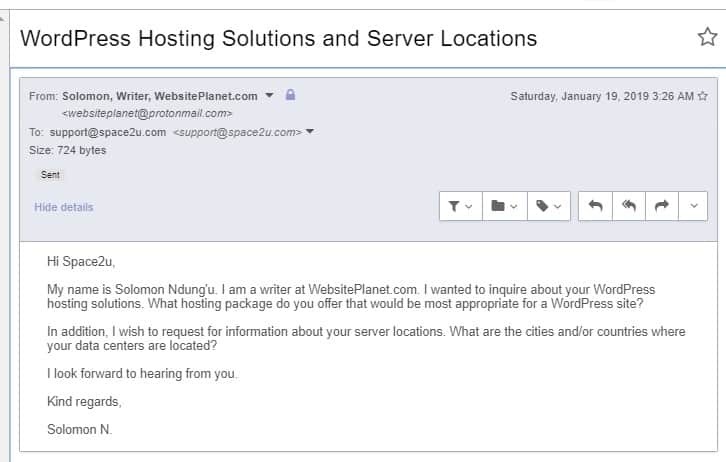 Space2u Review 2019: Is Space2u a Good Hosting? Space2u has over 16 years of experience in the hosting industry. It offers shared hosting solutions, VPS solutions, domain registration services, and dedicated server solutions to businesses in Sweden and beyond. With more than 15,000 customers, Space2u is one of the leading web hosting companies in Sweden. Established in 1998, this hosting provider offers premium web hosting services to Swedish customers and those in other countries including Brazil, Switzerland, Denmark, and Poland. This vendor’s hosting solutions include shared hosting, dedicated servers, cloud hosting, and VPS solutions. Space2u’s website is only available in Swedish. This provider’s modern data centers use enterprise-level hardware and software powered by Dell, Halon, NetApp, and Microsoft. To accommodate large websites with the most demanding traffic, its dedicated servers come with RAID-1 SAS disks, Xeon 4 Core E3-1220 v5 processors, and RAM of between 16GB and 64GB. 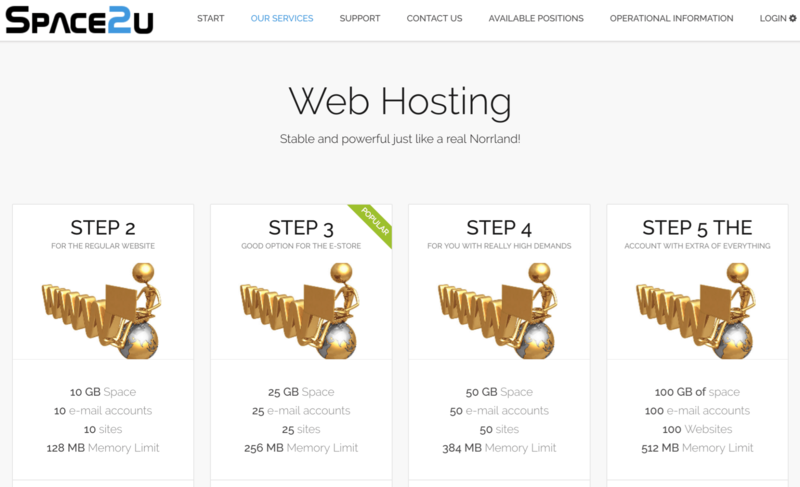 The four web hosting packages – named Step 2, Step 3, Step 4 and Step 5 (I don’t know what happened to Step 1) – offer between 10GB and 100GB of space, 10 to 100 email accounts, 10 to 100 websites, and 50GB to 400GB traffic. Although Space2u’s hosting solutions include daily backup services, this vendor also offers an extra cloud backup package that accommodates clients who require advanced backup services for big files and folders. Also, Space2u provides exchange hosting services that utilize Exchange Server 2016 and come with an unlimited number of aliases plus 10GB disk space. Space2u’s solutions are quite expensive, although they do include a good number of features. Prices are listed in Swedish krona, and you can pay for plans monthly. There is a 45-day open purchase period within which you can get a full refund if you’re not satisfied with this company’s hosting services. What’s more, you get a good 99.99% uptime guarantee. For hosting related issues, you can contact the Space2u customer support team via telephone, email, support ticket, live chat, and social media channels. Customers in Västernorrland County, Sweden, can also visit this vendor’s offices on weekdays and even at weekends. Admittedly, I’m not a current customer, and I sent my message to the Space2u support team rather than its sales team, but I would at least expect the recipient to have forwarded it to the correct department. The good news is that you can support yourself by referring to this company’s comprehensive knowledge base and online guides sections of its website. With more than 16 years of experience in the web hosting industry, it is not surprising that Space2u has grown its customer base significantly by improving its hosting infrastructure and creating the capacity to host businesses of all sizes. Since I can’t be sure about the support team’s responsiveness, this supplier’s services might be better for advanced users (who can support themselves) than beginners (who can’t). Wondering how Space2u stacks up against other Web Hosting companies? Enter any other Web Hosting company and we will give you a side-by-side comparison.